Nadine is a Richards Bay local who, after travelling through parts of Europe and Asia, completed her BA Soc (Hons) (Psychology) in 2004. She is a registered Psychometrist and works for a boutique management consulting company based in Richards Bay. The focus of her career has been on the identification of potential, leadership, talent management, individual and team development, mentoring and coaching through the use of assessment centres and psychometric tools. 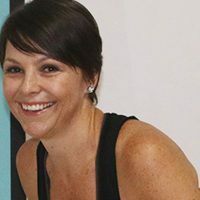 Nadine’s Pilates journey started approximately 6 years ago, when she started attending group classes. Holistic wellness had always been close to her heart and Pilates proved to have a profound impact on her overall wellbeing. Consequently, the idea of completing a Pilates instructor’s course started to take shape. She started the BASI Comprehensive Teacher Training Course in February 2015 and completed her qualification towards the end of that year. Nadine is currently teaching Group Mat, as well as Equipment classes at Bodyline Studio. Nadine has been happily married to Ettienne (who is also committed to a strict Pilates regime) since 2010.